Bought a used set from Ebay for $80 bucks. 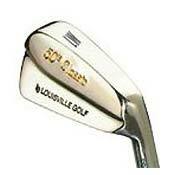 These are the best irons I have ever hit. Although they are forged blades they are more accurate than my cavity backed irons and have a better feel than my Wilson Staff tour blades. Louisville Golf is a great company. My bag is now filled with Louisville golf persimmon drivers, woods and putters. Since I started playing exclusively with these irons, my handicap has dropped from an 18 to a 13.
just started to golf 3 yrs ago, looking for something easy yo hit, and threre they are..... 100 dollars barely used. changed the grip on them and fell in love with them ever seen. MY GOD-TO THINK I HAVE WWASTED THOUSHANDS OF DOLLARS ON MIZUNO"PING"CALLAWAY AND A HOST OF OTHER IRONS.I HAD A SET THAT WAS STOLEN AND JUST FOUND THESE AND SHOT MY BEST ROUND EVER.I PLAYED ANOTHER 18 JUST TO MAKE SURE.SAME RESULTS.THE MOST ACCURATE IRON HANDS DOWN.LOUIEVILLE NEEDS TO START MAKING THESE AGAIN.IF YOU FIND A SET BUY THEM.THANK GOD I CAN GOLF AGAIN. I HEARD NOTHING BUT GREAT SERVICE AND A TOTAL DEADACATION TO GOLFERS AND THERE NEEDS. ABOUT EVERY TOP FORGED IRON ON THE ^%(_+# PLANET. Reshafted with the new UST 75 Gold Iron shafts these Irons are smooth like ??? never thought i can hit a blade this easy-even the 2 Iron goes off easily- I hit the Louisville slugger in my little league ,like Jack Daniels- but these Irons are best in town !!! Great playing and looking clubs. Among the beast blades on the market. A real value at $499 3-wedge. Excellent. You talf to the club maker when you order the clubs. I got the 2002 Big Berthas a couple of months ago, and like the huge sweet spot, but when I saw these, I couldn't pass them up. Beautiful forged blades barely used for $149 ? I don't know if its the forging, the sensicore shafts, or the fact that they're 1/2 inch longer, but they're as soft as the big berthas! Try forgings. Think of MP-14s and that's what you have here: same foundry, same design, same lofts, lies, etc. I've had mine refitted with Dynamic Gold w/ sensicore and Winn grips and they are just as sweet as can be. Outstanding, personalized customer service; Louisville Golf is a relatively small shop with a great history and commitment to golf. My requests have always been handled professionally and well. Having used the irons with Tour Rifle Shafts, would have to say these are the best irons I have ever had, the soft feel of the stainless steel gives you that soft, high flight that I have always wanted, having used Goldsmith forged blades it was hard to give these up, BUT...!! these were worth the move out of 10 I would give these 9.95 nothing is perfect but these are close!!! !